Tickets start at just £10.00. Click here to book or book direct from the Civic Centre 01948 665761 with no booking fees. From 11am on Saturday 24th November the town will celebrate the start of the Christmas season with an indoor Christmas Market in the Main Hall, a whole host of exhibitors will descend on the Civic Centre with a wide variety of gifts, crafts and unique items. The fair is free to enter and open from 11am – 4pm, an indoor café operated by Sarah’s Sarnies will be serving hot drinks, snacks and lunchtime meals. An outdoor stage will host a variety of local acts throughout switch on day including Whitchurch Town Band, Beacon Church Choir, the cast of Whitchurch Amateur Operatic & Dramatic Society Pantomime Snow White, The White House School, Glo’s Cheerleaders and Maggie May’s Performing Arts and many more. The Crib Festival at St Alkmund’s Church will be open all day, showcasing a beautiful variety of nativity scenes. Christmas crafts in the Library will take place from 11am – 12 noon making “Festive Baubles”, this is free activity. If you haven’t already made a lantern for the Whitchurch Lantern Parade then the last workshop will be held from 11am – 1pm in the Civic Centre’s Market Hall. The lantern parade starts at 4.30pm from the top of Green End/Brownlow Street carpark. The Bullring will host a Children’s mini fairground and Father Christmas shall be arriving on his float from 3pm, with thanks from the Whitchurch Rotary Club. Visitors can enjoy free parking in all major town centre car parks from 2pm – 6pm thanks to continued support from Shropshire Council. Car parks where free afternoon parking applies include: Newtown, Castle Hill, St John’s Street, Pepper Street and Brownlow Street. 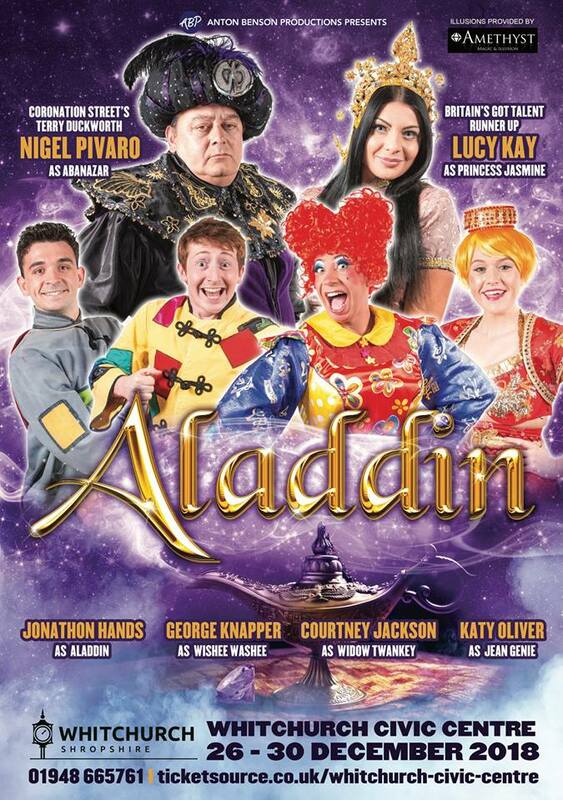 Cast members from Anton Benson’s Pantomime Aladdin will also be making an appearance on the day so you can meet the actors. 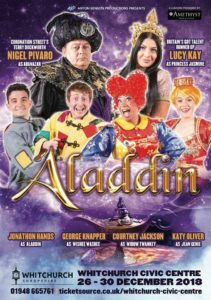 The pantomime is taking place at the Civic Centre in between Christmas and New Year from 26th – 30thDecember 2018, tickets start at just £10.00. https://www.ticketsource.co.uk/whitchurch-civic-centre or book direct from the Civic Centre 01948 665761 with no booking fees. The Mayor of Whitchurch Cllr Tony Neville said “I am very proud to announce that this year’s Citizen of the Year is Arthur Skitt. Arthur does a great deal for the community of Whitchurch and he is a stalwart supporter of our events and markets. Always ready with a smile and a kind word, I’m sure you will agree that Arthur is a most worthy winner.” As part of the recognition Arthur and friends will enjoy afternoon tea at the Civic Centre and assist the town Mayor in switching on the lights this Saturday evening. Visitors can enjoy fresh hot food and drink outside as they wait for the big switch on at 5pm. Fireworks will follow the switch on so please leave all dogs at home. 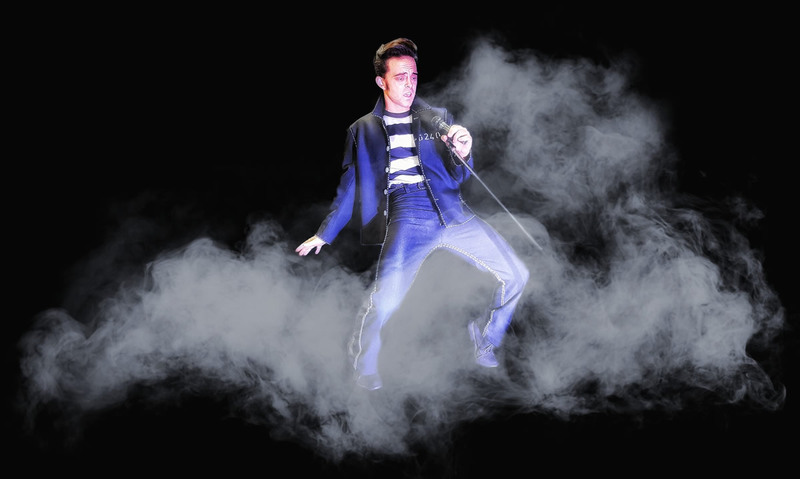 Following the switch on the crowd will be treated to be a live performance from Jo-El as Elvis, ahead of his Elvis Odyssey Tribute Show at the Civic Centre from 8pm, on the night of the switch on. Tickets are still available at £12.00 each. Don’t rush home as soon as the lights are on as the fairground and Father Christmas will still be open and independent businesses within the Town Centre will be open until 6pm. Join us in Whitchurch for a day of festive cheer!